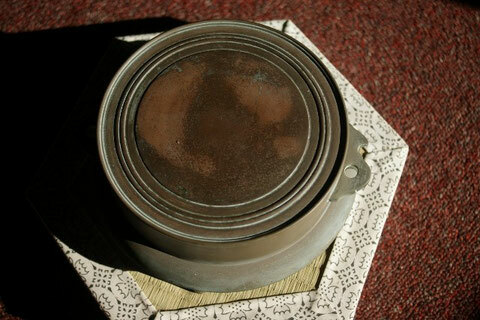 A Buddhist Gong called "Fuse-Gane" or "Shoko". This gong is rang when chanting Nembutsu. When I turned this gong upside down, I happened to find some old characters....It says, "Year 1850 (Kaei-San-nen), January 25th....Ryogakuji Temple. 1. Members are old. I don't want/expect them to work hard. 2. I can shine the altar much better... by young man-power. 3. I can do this anytime when I have time. 4. I like myself who is working so hard. 5. This is my expression of highest respect to Amida Buddha. Because the temple altar is for Amida Buddha, I have a feeling that I should do the best and I love seeing the improvement after spending my energy. 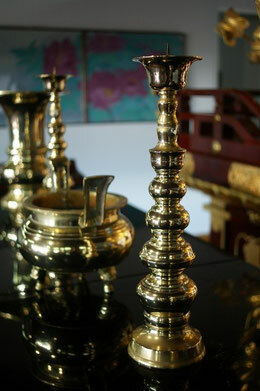 The more I polish the brass items, the more shinning they surely become. I think you can tell it from the picture. As you may know, in old days, material donations were more common than monetary donations. 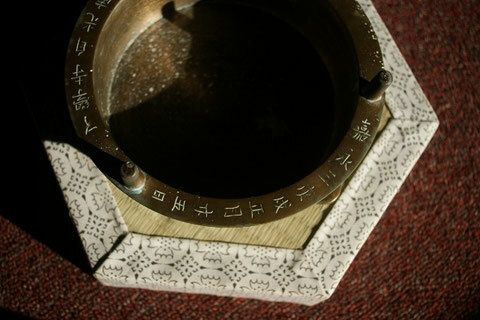 Almost all Buddhist items like Bell, Wooden Block, Vase, Candle Holder, Incense Burner, have their sponsors and name of sponsor, name of the deceased, and the date of donation, were usually engraved on the item. This time, I was very mindful of the items of donors. I thought I knew all the names of material donations, but I first knew the buddhist gong, called "Fuse-gane", was made in 1850! I knew this was a donation by a lady called, "Sayo", but when I turned this upside down, I found the date of donation were engraved. It was January 25, 1850 when Sayo made donation to the Ryogakuji Temple in Tokyo. I don't know why and how it came here, but at least I knew Ryogakuji Temple (Jodo shu) no longer exists according to the information from google. I guess because the temple was closed, its belongins were redonated to the temples which they need to have. Now it is almost impossible to know the behind story of this gong, but one thing for sure is the sound of gong here is 162 years old. The gong itself never say anything but we should listen to its sound of gong carefully, since it is still offering beautiful sound, together with Nembutsu.